Growth of 946 percent in three years puts us at #486 on the prestigious Inc. 500 list. 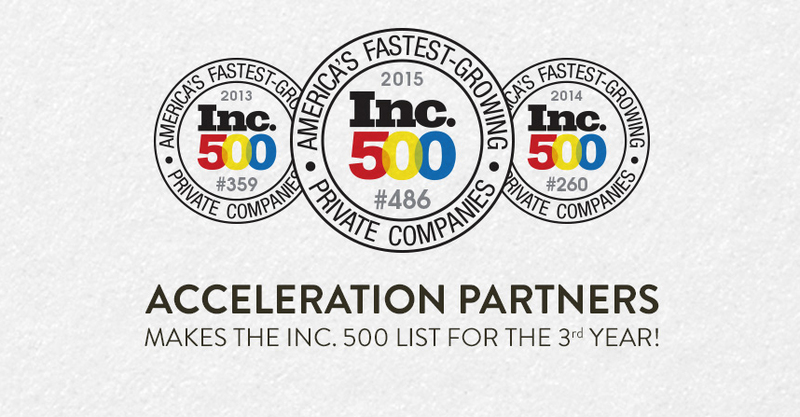 We’re excited to announce that Acceleration Partners has made the Inc. 500 list of America’s fastest-growing private companies for the third year in a row. AP is one of only twenty-seven companies named to the 2013, 2014, and 2015 Inc. 500 lists. This year we’re ranked #486 on the list with a growth rate of 946 percent over three years after ranking at #359 in 2013 and #260 in 2014. Making the list puts us in some pretty great company. Pandora, Timberland, Dell, LinkedIn, and Zappos are all past honorees. We owe a huge thank you to all of our clients, who are among some of the most recognizable and innovative consumer brands in the world. It’s a great privilege to work with them and grow alongside them. We certainly wouldn’t be here without their incredible partnership. The AP team also deserves kudos for all of their hard work. This is an honor shared by every member of the company. Their dedication and passion is what makes AP such a great place to work.